The couple poster photo shoot. 44 seconds of cute! This picture just might be my favorite. The mix of Joseon and Seoul. Micky Yoochun’s awesome face and Han Ji-min’s utter adorableness. The first teaser. These short ones really don’t even whet the appetite. 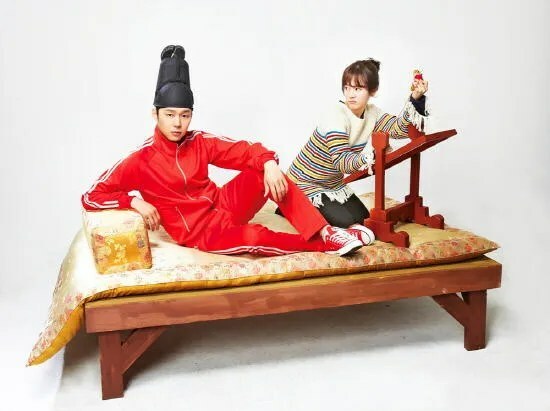 JYJ3 posted this AWESOME seven-minute Rooftop Prince teaser that begins with tragedy and ends with hilarity. Now this one I’m really looking forward to, I mean a time-traveling prince? landing in modern times without any knowledge of it… heh that’s going to be even better than traveling to the past! yay! can’t wait. But the kingly headgear and the tracksuit was SUCH a good call on the production team’s part. YES. They get soooo many points for that. But yes, he is one of the few who seriously rocks traditional garb. On top of that, his acting looks soooo much more nuanced now. I’m stoked, stoked, STOKED! I can not wait for this show to premiere. Only in Kdramaland can I want a certain month to hurry up and get here. I think that this show will be my new crack after SU: FBB ends (booo oh the epic bromance I will miss). Hurry up next week and get here already,please! She is quite different, no? But I like the change because she was so serious in PdPd. I’m only on episode 12, but hopefully will finish soon. 😀 Thanks for stopping by. That long trailer just won me over! Awesome indeed! Glad there is something to look forward to after SUFBB will finish! I KNOW! I saw it and was like…must post this awesomeness. And did you see the improvement in Micky Yoochun’s acting. I was sold. The trio looks adorable and Han Ji-min is so cute I want to put her in my pocket. The tracksuit makes me think What’s Up ghost…..! OMG I love Red Tracksuit. He’s one of the best side characters other. And that guy had the most expressive face!